Schopenhauer had it easy; he simply had to write his elegant prose to make philosophy and science indistinguishable with literary insights drawn from an inkwell. This is perhaps the reason why he was unknown in his time but had everlasting fame as the philosopher of genius. Today, reviving the humanities means connecting these separate disciplines to form a holistic human model capable of meeting the challenges of the 21st century. A 30-year correspondence between C.G. Jung and Wolfgang Pauli, the father of modern science, resulted in a mutual prophecy of the 21st century icon, the Hieros Gamos, revealing an emergent holism of the psyche. Yet their joint project failed to meet the stated mission of marrying psychology and science (Roth, 2012). Now this vision finds success in Jung’s Switzerland. Vincenzo Di Nicola, a Canadian psychiatrist, had a breakthrough while working on his Ph.D. with the French philosopher Alain Badiou in the final years of the Schirmacher laboratory European Graduate School in Saas-Fee. Di Nicola’s entanglement with Badiou was sourced in the merging of their separate notions of event (philosophy) and trauma (psychiatry). “I decided to examine nothing less than the history of modern psychiatry and its relationship to philosophy by investigating trauma,” he writes in a two-part paper in the American Philosophical Association blog. “During my seminars with Alain Badiou (2005, 2009a), I was struck by the symmetry between his description of the event as an opening and my emerging understanding of trauma as a rupture. When I consulted him, Badiou immediately recognized trauma/event as a fresh and innovative pairing” (Di Nicola, 2017). Di Nicola’s Trauma and Event throws the symptom-based DSM (Diagnostic and Statistical Manual) and methodological EBM (Evidence-Based Medicine) out the window. It essentially flattens the patriarchal hierarchical model of psychotherapy, which he sums up as hermetically sealed, into mutual observation, a collaboration between patient and healer. “The face-to-face encounter that Levinas described can never be altogether symmetrical but we identify the asymmetry as much as possible and negotiate the differences,” Di Nicola explains. “Psychoanalysis is being conceived more and more as a ‘bipersonal field’ and so much work is going on in this field that Werner Bohleber (2010) refers to an intersubjective turn (Di Nicola, 2017). This new practice identifies the Di Nicola “orphan” in-between diagnostic categories signaling an unexpected “event” by means of the rupture preceding trauma. The psychiatrist explains the process as one of psychic reorganization following profound insight, or what physicists qualify as a quantum leap. Di Nicola writes about how James Joyce, who was influenced by Freud through the first Italian psychoanalyst, Edoardo Weiss, called this an epiphany: “Joyce’s epiphany is Freud’s insight and may be understood as something that occurs in the eventual site, which I call a predicament. The epiphany or insight is a response to the predicament. We could go so far as to say that the predicament, the eventual site, is a necessary condition for insight. Only a cut, a tear in the world can create the acute sense of a rupture that requires a response. Once the analysand has her epiphany, thoughts, actions and feelings are at first interpreted, and later experienced, differently. For this translation from interpretation to insight to new experience to occur, a deep fidelity must accompany the procedure” (Di Nicola, 2017). Fidelity fits with the French philosopher’s view of psychoanalysis as love, which means interrelationship, energy flowing from the heart, as opposed to solely from mind. Crossing the border from psychoanalysis to philosophy, we pick up on Badiou’s language for the Event through the psychiatrist’s interpretation: “In my reading of Badiou, the three conditions for an event are: to encounter an event (which is a purely contingent encounter), to give it a name, and to be faithful to it. The subject emerges through the event. By naming it and maintaining fidelity to the event, the subject emerges as a subject to its truth…‘Being there,’ as subjective phenomenology would have it, is not enough” (Di Nicola, 2017). Alain Badiou lecturing on the “Event as transcendent from the local origin into the world” in a seminar attended by Lisa Streitfeld. The French philosopher’s evening lecture (August session 2014) on the topic catalyzed the author’s observation of the convergence of the Humanities into the Third. In other words, pro-activity remains essential for an event to sustain itself as a self-contained entity. This suggests that a quantum leap culminating with Di Nicola receiving his doctorate in 2012 set the stage for an Event in Saas-Fee two years later, when four philosophers (Hardt/Negri, Harman and Lovink) followed the French philosopher’s Monday evening talk on the Event (“An Arrow into the world”) by announcing a quantum leap into the Third in their respective fields (Streitfeld, 2014). The great question is whether the field of the collective unconscious is such an arbitrary random pattern of archetypes, a field in which the excited points are archetypes or does it have some order? Jung has already pointed out that among the different archetypes, there is one which encompasses and regulates all the others and that is the archetype of the Self….Let us say it is an active ordering centre which regulates the relationships of all other archetypes and gives to the field of the collective unconscious a definite mathematical order….In China the dynamic processes are represented by groups of threes and the result is represented by a quaternio….The triads always point to dynamism and therefore to action in a situation, while the quaternios always point to, or describe, the whole situation….So we can now go on with our definition and say the collective unconscious is a field of psychic energy, the excited points of which are the archetypes, and that field has an ordered aspect which is dominated by the number rhythms of the Self, which as you will see are triads and quaternios. With the number oracles and divination techniques one tries to define the process of the Self archetype….Jung points out that the Self is in an eternal process of constant rejuvenation. He compares it to the carbon-nitrogen cycle of the sun, where certain particles are split off and others attracted, giving finally a rejuvenated atom of the same form. It is as though the atom split off particles and attracted others, thus restoring its own form in constant self-renewal (Von Franz, 1980, pp. 65-66). In honest histories of science one may find such an observation, namely that strangely enough there is a tendency for certain ideas and inventions to crop up in different places at the same time. From a psychological point of view that is not such a miraculous thing. In the spirit of time, so to speak, certain questions and psychological problems are constellated. Then several intelligent people have the same question in mind, chase along the same alley and come to the same results, and that is due to the constellation of an archetype in the collective unconscious (Von Franz, 1980, pp. 71-72). Di Nicola maintains his consistency with the triad by listing his Saas Fee influences as a triumvirate: Badiou, Foucault and Agamben (Di Nicola, 2017). Badiou’s predilection for organising thoughts in thirds as a phenomenology was made evident in his paper on Marcel Duchamp and the number three (Streitfeld 2018); Di Nicola follows this creative path by declaring that Badiou “offers three profound things to psychiatry: a theory of the subject; a theory of how philosophy works; and a theory of change based on the event.” Furthermore, he clarifies psychiatry’s central task in thirds: a general psychology as a science of human being; a coherent theory of psychiatry as a discipline; and because it proposes to help people, it needs a theory of change (Di Nicola, 2017). Within the Third space, the in-between realm of Di Nicola’s “orphan,” a correct diagnosis may be made from the 360-perspective of Kairos, or the Aha Moment. With entanglement, the phenomenon of two physically separate particles sharing the same existence and time is revealed through the process of observation of the quantum state for the whole system. In this manner, the new science marrying philosophy and psychiatry catalyzing the 2012-2014 culmination of the Saas-Fee laboratory may also be evident in a therapist/patient observation making a simultaneous quantum leap from the “bipersonal field” to the Third. The events, one could say, are shown in an ordered time field, and that is the way in which the Chinese use number. Number gives information about the time-bound ensemble of events. In each moment there is another ensemble, and number gives information as to the qualitative structure of the time-bound clusters of events…number is an archetypal representation or idea which contains a quantitative and a qualitative aspect. Therefore, before we can touch the whole problem of divination, we have to revise our view of number and of mathematics. From there we can probably approach certain other factors, which until now we could only confess we could not measure but could only approach with the feeling function (Von Franz, 1980, pp. 71-72). Bringing exiled Jungian post binary thinking into the fold of continental theory, Von Franz’s exploration of synchronicity through ancient methods of divination underscores Di Nicola’s declaration sourced in his infans solaris birthed out of the Third with the great living French philosopher: “What could be more critically relevant to a 21st century science of the mind and of human relations than a return to metaphysics?” (Di Nicola, 2017). Badiou, Alain (2008). “Some Remarks on Marcel Duchamp”. The Symptom 9. Retrieved from: http://www.lacan.com/symptom/?p=39. June 10, 2008. Accessed February 3, 2013. Di Nicola, Vincenzo (2012). Trauma and Event: A Philosophical Archaeology. 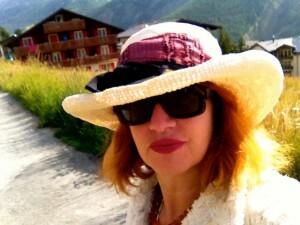 Doctoral dissertation, Saas-Fee, Switzerland/European Graduate School. Di Nicola, Vincenzo (2017). “Badiou, the Event and Psychiatry”. Blog of the APA (American Philosophical Association), https://blog.apaonline.org/2017/11/23/badiou-the-event-and-psychiatry-part-1-trauma-and-event/. Accessed March 1, 2018. Streitfeld, Lisa (2014). Hermeneutics of New Modernism. New York/Leipzig: Atropos Press. Streitfeld, Lisa (2018). “The Third Mind: Badiou, Duchamp and the Autonomy of Number as the Phenomenology of a New Modernism”. 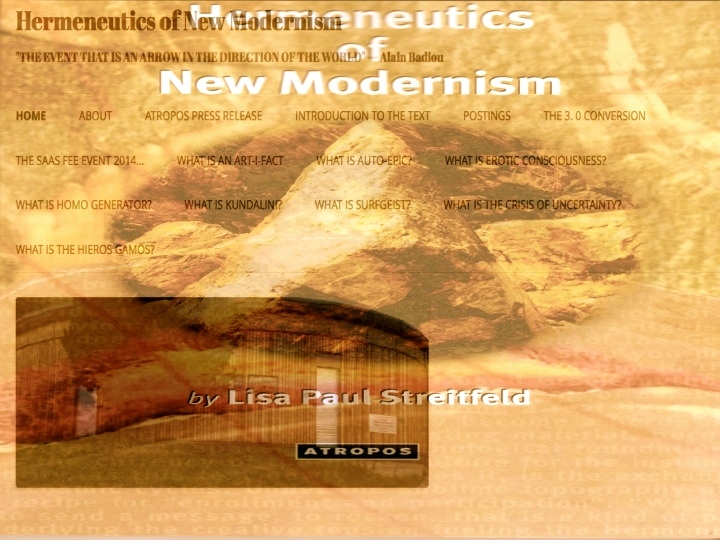 Hermeneutics of New Modernism. http:hermeneuticsofnewmodernism.wordpress.com. Roth, Remo (2012). The Return of the World Soul: Wolfgang Pauli, C.G. Jung and the Challenge of Psychophysical Reality. Pari, Italy/Pari Publishing. Von Franz, Marie Louise (1980). On Divination and Synchronicity: The Psychology of Meaningful Chance Studies in Jungian Psychology. Toronto/Inner City Books. 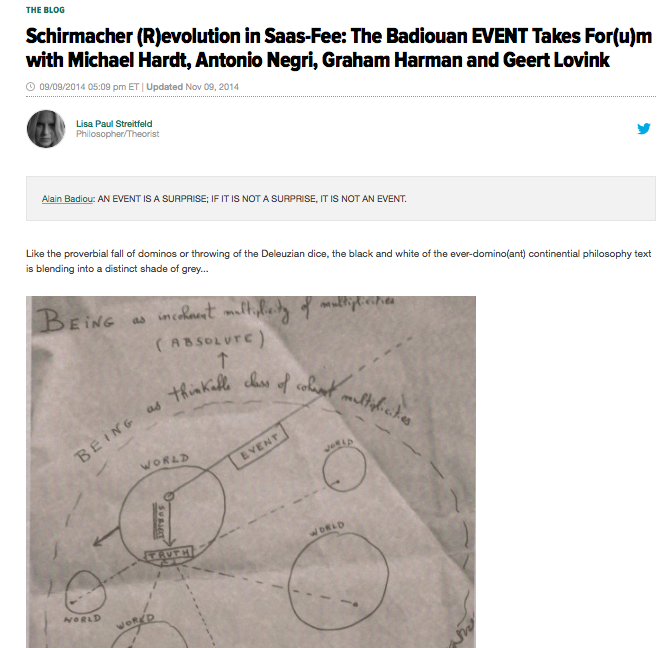 This entry was posted in EVENTS and tagged Alain Badiou, European Graduate School, philosophy, the Event, Vincenzo Di Nicola on December 9, 2018 by Dr. Shiva Lisa Paul.